Wayne Davis II says he is fascinated by illusionists and magicians. Well, Deworski Odom and Johnny Dutch, don't be surprised if the Track EC/SE Raleigh NC junior makes your indoor hurdle records disappear in the weeks ahead. 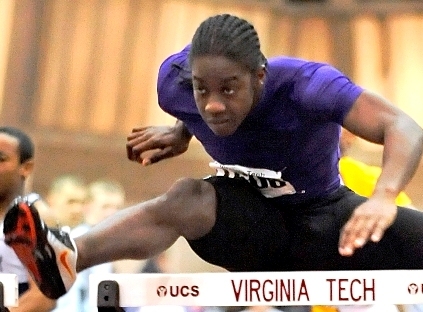 Davis's new PRs of 7.63 (60H) and 7.08 (55H) -- the latter having taken place at Virginia Tech last weekend -- are just .01 off the respective US records owned by Odom and fellow North Carolinian Dutch in those events. Flash back to a year ago: You probably hadn’t heard of Wayne Davis II – unless, that is, you were a big follower of age-group youth track or a fan in North Carolina. But the sharp-eyed would have noticed that he had run 14.18 his freshman year over the 110s, just .02 off the national frosh mark, and setting an age-14 US record. What a difference a year makes, as they say. Wayne's improvement curve was sharp last winter and he would go on to take 3rd in the NON 60H at 7.83, a soph record. 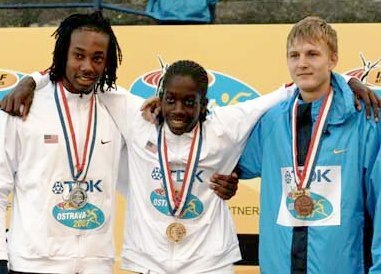 But it was only the start of a career-transforming campaign that would see him beat everyone with a negative-wind 13.65 (-0.7) 110H at NON (another soph record), then go on to become a true national and global star with his victory over the slightly shorter 110Hs in the World Youth Championships. The evolution has continued this winter. With 15 extra pounds of muscle on his previously slight frame and months more of technique study and application, Wayne has taken complete leadership of the short barrier events for preps. To watch the Track EC/SE Raleigh junior elevate over the barriers, with technique that seems to border on flawless, is a sight to behold. To talk with him, however -- as DyeStat News Editor SteveU does here -- is to see someone who is far from content and lacks no motivation to continue to progress further and further. 1. Wayne, it’s not even February and you’ve already had an amazing year. Did you come into 2008, and into these early meets, with serious designs on taking down both indoor records? Or has it more been a by-product of the improvements you’ve made and the strength you’ve added? Both the strength and technique is part of the serious design on taking down both indoor records and outdoor records. For the past two years, in high school track, people usually beat me because of strength and maturity. I decided to hit the weight room harder and let time and technique do its work for me. 2. Can you talk about your start in this sport, and how you gravitated to track compared to others? What was your introduction to the hurdles, who were some of your inspirations, and how did it become your favorite event? And as a student of the sport, which I hear you are, what kind of work you do to learn about the all-time greats and applying what you learn to training and racing? 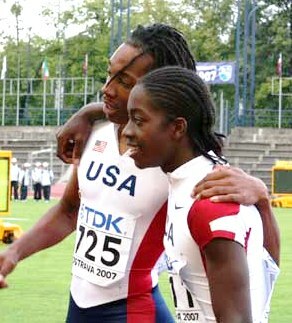 I started when I was eight in USATF. I was not at all serious about the sport; I was just doing track for football. At one time, football used to be my favorite sport, but then I realized why wait for a team to make something happen when you can do it by yourself? I was first introduced to hurdles when I was watching the 1996 Olympics with Allen Johnson’s 110H gold. The hurdles became my favorite event, because I was naturally an adventurous person who did things many people hesitated or didn’t want to do. My inspirations have been Allen Johnson, Liu Xiang, and Asafa Powell. My coach, Steve McGill, led me into the more technical aspect of hurdling. Watching videos of all the great sprinters and hurdlers, and modifying their technique to my body type,and finding the right modification, took a lot of trial and error. I still have a lot to fix with my technique, though many think I am crazy for saying that. But when I get it down I’ll surprise myself with how good I will do. 3. Was there a point in your training and racing, either as a youth or in your first two years in high school, where you mentally made a transition from just thinking about improving or being competitive on a local level, to becoming a national or world-class runner? Talk about how your mental perspective has evolved. After being in USATF for a few years I was used to being one of the top in the nation. I made it to Junior Olympics every year since I started running except for 2004, when I had hip flexor and knee problems. When I got to high school, I thought it should be the same way, just without the age groups. It was a big transition from a national level to a world-class level. Running at a world-class level boosted my confidence further. As time passed, I have become more confident in my abilities, but still competent and not taking winning for granted. No matter how much I win, I will still look to perfect my technique to increase my success. 4. Not too many people had you as the favorite to win last spring at NON. Can you talk about that weekend and what that victory meant to your confidence and expectations? Winning at NON was an unbelievable feeling. The year before my win in NON, I was a volunteer at the meet just watching the hurdles thinking I should be in that race. The victory blew away my reality to what was possible for me. I am working to win it every year until I graduate. 5. Going to a world meet in a place like the Czech Republic had to be an awesome experience. Besides winning on the track, what were some of the highlights from that trip, maybe some things that a lot of people don’t know about? What are some of your best memories from there? I played Charades every day with a few teammates and some athletes from different countries, and they were the best games of Charades I have ever played. It was “true” Charades because of the language barriers and it was totally fun. I also enjoyed meeting other athletes from different countries and just getting to know them. At the end of the meet the teams went to a dance party. I had a great time there dancing with people I couldn’t even hold a conversation with because of language barriers. I also made friends with people from other countries who I still keep in contact with. 6. I’ve heard you can be very talkative and like to joke around off the track, but that leading up to a race you make a complete transformation into a very serious, quiet person. Can you talk about mental preparation before a meet and the importance of having a balance and not being serious all the time? How does that balance work for you? True, I don’t like to be serious all the time, and just being in a good mood is good for your body alone. People who take track too seriously usually end up burning out because of mental stress, and I realized being in a good playful mood is the best way to prevent that kind of stress from happening. Getting serious is usually easy for me, because before race time the adrenaline starts to kick in. I have even practiced with professionals and they are on the most part not taking themselves too seriously. 7. Obviously, a great support team is vital for most top athletes. Can you talk about your coaches and family and how they contribute to your success? My parents and family support me fully and encourage me to do better than even what I think is possible for anyone to do. Some of my coaches look at me in disbelief and at the same time they know I can do better. My coaches never have a set expectation for me; they don’t like to limit me to a certain time. Coaches and family have overall kept me dedicated and focused on the sport. My family has done so much to support me that I would not know how to begin talking about it. 8. Your impulse to study the event and become a better and better technician makes me think of a couple things while wondering what you like outside the track … One, that you might be someone who’s really into math and/or science, and, two, that you might be someone who eventually wants to pass your knowledge on to others, maybe getting into coaching. Are we on target here? Tell us about your interests beyond competition. Outside of track I am into physics and how I can use the laws to help me become a better hurdler. I want to coach eventually and I have a lot of respect for coaches, because I tried to coach people how to hurdle and it is VERY hard and frustrating. You’re on the right track. I collaborate martial arts and I take some tricks of the trade from martial arts and apply them to track and field. It is regular for me to go out with friends to the mall, to movies and all the regular teenage stuff. I am really interested with illusionists and magicians. 9. One more thing … it has to be a big adjustment, going from being a “contender” to being someone at the very top, as you’ve done so quickly. I’m told you’re someone who’s very humble, though, and very gracious to your competitors. Is that something really important to you, that helps keep you balanced? I just don’t like to be cocky, because people will just look at me as a really good athlete rather than the person behind the athlete. Being gracious to people is what my parents always taught me, and I think it helps prevent me from becoming full of my self and arrogant. Just by being gracious conveys to people that I am a fun-loving, nice person behind being a good athlete.